The first of a set of unprecedented, super-deep views of the universe from an ambitious collaborative program called The Frontier Fields is being released today at the 223rd meeting of the American Astronomical Society in Washington, D.C. The long-exposure image taken with NASA's Hubble Space Telescope is the deepest-ever picture taken of a cluster of galaxies, and also contains images of some of the intrinsically faintest and youngest galaxies ever detected. The target is the massive cluster Abell 2744, which contains several hundred galaxies as they looked 3.5 billion years ago. The immense gravity in this foreground cluster is being used as a "gravitational lens," which warps space to brighten and magnify images of far-more-distant background galaxies as they looked over 12 billion years ago, not long after the big bang. "The Frontier Fields is an experiment; can we use Hubble's exquisite image quality and Einstein's theory of General Relativity to search for the first galaxies?" said Space Telescope Science Institute Director Matt Mountain. "With the other Great Observatories, we are undertaking an ambitious joint program to use galaxy clusters to explore the first billion years of the universe's history." Simultaneous observations of this field are being done with NASA's two other Great Observatories, the Spitzer Space Telescope and the Chandra X-ray Observatory. The assembly of all this multispectral information is expected to provide new insights into the origin and evolution of galaxies and their accompanying black holes. The Hubble exposure reveals nearly 3,000 of these background galaxies interleaved with images of hundreds of foreground galaxies in the cluster. The many background galaxies would otherwise be invisible without the boost from gravitational lensing. Their images not only appear brighter, but also smeared, stretched, and duplicated across the field. Thanks to the gravitational lensing phenomenon, the background galaxies are magnified to appear up to 10 to 20 times larger than they would normally appear. What's more, the faintest of these highly magnified objects have intrinsic brightnesses roughly 10 to 20 times fainter than any galaxies ever previously observed. The Hubble data are immediately being made available to the worldwide astronomy community where teams of researchers will do a detailed study of the visual crazy quilt of intermingled background and cluster galaxies to better understand the stages of galaxy development. Though the foreground cluster Abell 2744 has been intensively studied as one of the most massive clusters in the universe, the Frontier Fields exposure reveals new details of the cluster population. Hubble sees dwarf galaxies in the cluster as small as 1/1,000th the mass of the Milky Way. At the other end of the size spectrum, Hubble detects the extended light from several monster central cluster galaxies that are as much as 100 times more massive than our Milky Way. Also visible is faint intra-cluster light from stars inside the cluster that have been stripped out of galaxies by gravitational interactions. These new deep images will also help astronomers map out the dark matter in the cluster with unprecedented detail, by charting its distorting effects on background light. An unseen form of matter, dark matter makes up the bulk of the mass of the cluster. As the Abell cluster was being photographed with Hubble's Wide Field Camera 3, the telescope's Advanced Camera for Surveys was trained on a nearby parallel field that is 6 arc minutes away from the cluster. 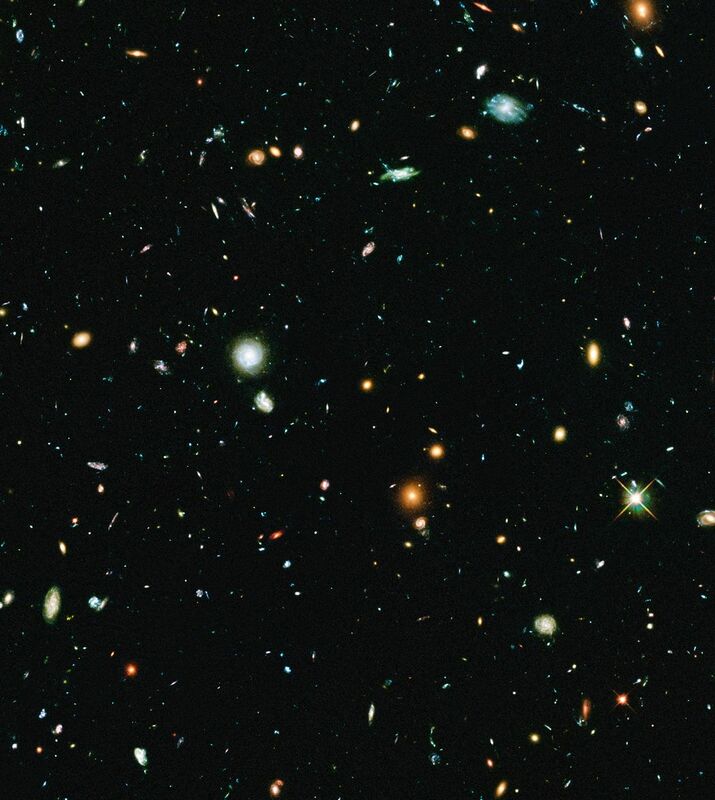 In this field, Hubble resolves roughly 10,000 galaxies seen in visible light, most of which are randomly scattered galaxies. The blue galaxies are distant star-forming galaxies seen from up to 8 billion years ago; the handful of larger, red galaxies are in the outskirts of the Abell 2744 cluster.